Friend Megan Kromer first brought the plight of the La Villita food pantry to our attention last week. It’s a case study for compassionate cities. La Villita, the original one-block “little city” of San Antonio, is owned by the city. It was rescued from decrepitude by then-mayor Maury Maverick in 1939 as the RiverWalk was being built and now advertises itself as an “historic arts community.” There was an article in the Express-News last week about the city’s intention to put the leases on the buildings in La Villita up for grabs. Current shops and artist studios will have to bid to retain their leases, some of which have been held for decades. But that’s another story. Among the the buildings that the city owns The Little Church of La Villita and its food pantry, a two-story warehouse, which also is home to an art gallery which supports the pantry. They aren’t compatible with city’s vision to revitalize the downtown and attract more locals into La Villita. That will take, they claim, a restaurant and an event space. The buildings designated for this are the church and the food pantry. The food pantry has been there since 1956 and currently serves about 600 food insecure families a month. If you’re without a home, the pantry refers you to Haven for Hope: these are people who live in nearby houses and apartments. “It’s probably the largest building in La Villita, which I think becomes a very desirable building for a potential great restaurant,” Department of Culture and Creative Development Director Felix Padrón told the Express-News. Councilwoman Ivy Taylor told the reporter she doesn’t see how the food program would “fit” with what’s been outlined. Diego later discovered that in the 1980s the church had sunk a lot of money into refurbishing the derelict warehouse with the promise they would be allowed to stay there. He told Express-News columnist Brian Chasnoff that he believes the city ought to honor that promise. Moving . . .sends a message, perhaps unintended, that the mission of serving those in need in this community is secondary to serving people at hip, new restaurants. This is supposed to be the decade of downtown, with a revamped HemisFair Park, new housing, a streetcar line and other projects. But making downtown “new again” doesn’t mean history and tradition should be cast aside. History, in fact, is what makes downtown a jewel. With that in mind, the council may find preserving the Little Church and its mission to feed the poor of far greater long-term value and significance than a shiny new restaurant. How can they think that removing a place of compassion from La Villita is a good move for the city? Is pretending that we have no hungry good for tourism? Why isn’t it a better idea to show people how we care and will feed the hungry right in the epicenter of this city and the heart of its tourism center? We have “sanitized” downtown enough already! So what do you think? What is the compassionate thing to do? What questions should we be asking of the city? How do we make sure that the hungry are fed? 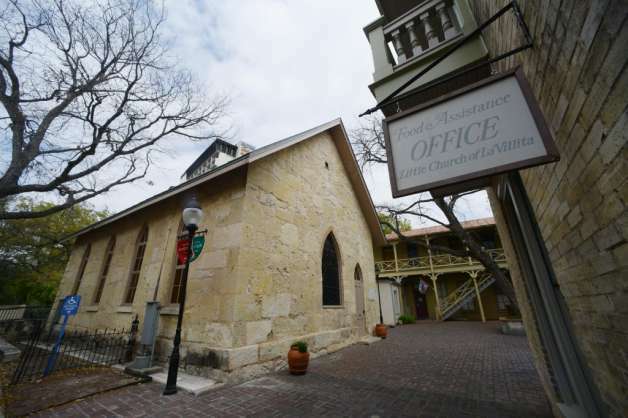 Update: Although the Express-News editorial appeared this morning, on Friday — three days ago — Fox News reported that the city has dropped it’s plan to turn the church into an event space and the food pantry into a restaurant. It an issue that still bear watching, and discussing, though. What kind of a city do we want to be?